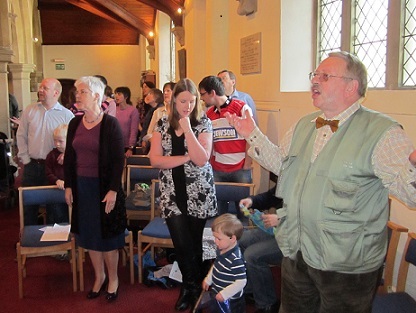 At St Philip & St James Church we use a mixture of contemporary music and lively worship together with more traditional hymns and the worship you would expect to find in a Church of England Church. We are a welcoming church that tries to offer something for occasional visitors, regular church members, and people of every age. We start each Sunday with a lovely service of Holy Communion (or Morning Prayer on the 4th Sunday of the month). This service uses a regular CW order of service and contains hymns, readings, prayers and a warm welcome! Each week we offer prayer for healing and on the second Sunday anointing with oil for those who want it. Yhe most popular service on a Sunday, the 10.30am service uses live bands, modern worship songs, good teaching and has a gentle charismatic feel. The service is relaxed, informal and contemporary in style with the simple liturgy and song words all projected on the overhead screens. Our prayer ministry team offer personal prayer after each service. Holy Communion is offered on the 4th Sunday each month with anointing. Each week we offer youth & children’s groups together with a creche for the under 3′s. We have a devoted group of ministry leaders who ensure that our ministry for young people is engaging and fun. Occasionally each year we meet for worship with other local churches and these are publicised in the Church notice sheet. On the third Tuesday of each month we meet in Church for a shorter Holy Communion service at 10:30am, with coffee provided in the Church Cenre for half-an hour before the service.